How Do I Claim For Compensation After The Event? Typically, making a claim for compensation isn’t a very regular occurrence so can often seem to be an overwhelming and confusing experience for those involved. But this can all be made clearer through talking to the right people and taking on-board the appropriate advice. Insurance is an overarching topic, so it should begin by narrowing down your reason for claiming in the first place. Was it a personal injury? If so, who is at fault? And where did the accident take place? If you have suffered a personal injury then you’re most likely going to need to take out an ATE insurance cover. You may have had an accident at the fault of something or someone else therefore a claim is to be made against the accused in question. This could be anything from clinical negligence to a trip/slip in the workplace. After the event insurance safeguards both individuals and organisations that are involved in any litigation. As the claimant you’re looking to protect your amenities and receive payment for any misfortune. It may be that you’re badly injured and need a sufficient amount of time off work; in which case you can be covered for the costs you’ll be losing out on. Most applications for after the event insurance are free, with legal services on hand to assist in collecting all necessary evidence in order to reach a successful claim. With regards to businesses needing to open up a case followed my court proceedings, the funding for such lawsuits is both costly and time consuming. This is where the ability of a third-party providing the finance lends a helping hand – mainly confined to commercial cases. It allows a business to take a case to court and fight for justice, when otherwise they can’t afford to pay the hefty legal bills. Litigation funders cover all the finances of bringing a litigation case and in return, they take back their initial investment as well as a return percentage of the proceeds (if the case is to successfully win). For businesses: Assisted funding will be of great advantage to a business as there will be no need for cash to be passed through or diverted from the business in order to pay the fees. For the individual: You don’t have to put yourself at risk or be forced to sell important assets in order to to pay the legal costs. It’s important that you don’t rush into acquiring solicitor’s advice as it’s costly and you may find they don’t always have the claimant’s interests in mind. Research is essential – shop around online to see whether or not they have been positively reviewed or even better ask your family & friends. Word of mouth is the best to put your trust in as you can listen to their previous experiences and make an informed decision. This article is written by Paul Henderson, who writes extensively on the topic of insurance for Guardian Legal Services LTD. Click here for more information on how to claim for compensation after the event. This page is simply a holding page for this domain name. The Barrister Blog itself can be found at http://timkevan.blogspot.com. Law and Peace is the second novel in The BabyBarista Files and was published in 2011. It can be ordered on amazon . It is the sequel to Law and Disorder which was described by broadcaster Jeremy Vine as "a wonderful, racing read - well-drawn, smartly plotted and laugh out loud" and by The Times as "a cross between The Talented Mr Ripley, Rumpole and Bridget Jones’s Diary". The books are based upon this blog which appeared on The Times for three years and now appears on The Guardian and which was described by The Lawyer as "genius". The Claim Group provide advice and solicitor guidance if you've had an accident in the workplace or on the road. Contact them today for assistance. The Barrister Blog is written by Tim Kevan who is the author of The BabyBarista Files, a series of novels published by Bloomsbury. 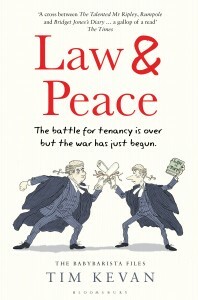 Law and Disorder was published in 2009 and Law and Peace in 2011. They are based on the BabyBarista Blog which he writes for The Guardian. He is also the co-author of Why Lawyers Should Surf. He lives in Braunton in North Devon, enjoys surfing and is a co-founder of two businesses, one of which has since been sold to Thomson Reuters. See www.timkevan.com. You can buy his books on amazon . The BabyBarista cartoons are by Alex Williams who also does the Queen's Counsel cartoons for The Times. © The Barrister Blog .com.